The air ambulance at Heathrow Airport London after transferring a patient. THE AIR AMBULANCE has completed its 100th journey of 2014. Last weekend the ambulance transferred a young patient from Casement Aerodrome in Dublin to Heathrow Airport, London. 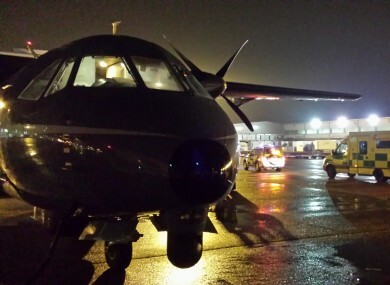 The CASA CN235 was deployed at 5.30pm Saturday and landed in the busy London airport at 7pm, where the patient was transferred to an NHS ambulance crew to complete their journey to hospital by road. In a statement released today, the Air Corps said that missions like this are “especially important to Irish children requiring transplants”. These time-critical patients are included in the UK’s donor pool and so rely on the speedy transport of the Air Corps when they receive a call to the UK for a transplant. The mission marked significant milestone for the Air Corps, in what has been a busy year for both national and international transfers of patients. Their ability to conduct multiple missions using fixed wing and rotary wing assets meant that on several occasions in 2014 multiple Air Ambulance missions were completed simultaneously. In the last fortnight the Air Corps transferred three patients to hospitals in Ireland and four patients to hospitals in the UK. They have also been called on for international transfers to other European countries during the year. Air Corps helicopter crews are the only pilots in the State who can utilise specialist night-vision goggles for night-time missions. In addition to inter-hospital transfers the Air Corps are continuing to support the HSE National Ambulance Service (NAS) in the pilot project to provide dedicated aeromedical support to the West of Ireland. The Emergency Aeromedical Service (EAS) operates from Custume Barracks, Athlone and so far this year has worked with the NAS on 425 occasions. Email “The Air Ambulance completed its 100th journey of 2014 over the weekend”. Feedback on “The Air Ambulance completed its 100th journey of 2014 over the weekend”.